Home » Home » Events » Paintball Tournament 2017! PAINTBALL TOURNAMENT AT SHEPHERD’S STAFF!! We are going to have a PAINTBALL TOURNAMENT on MAY 20 AT SHEPHERDS STAFF IN REXFORD! Come, young and old, with a team of 8 – 10 people. 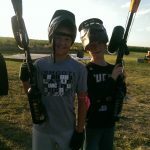 For $40 per person, you will play at least 2 games of paintball, get a hot dog, pop/water, and a bag of chips or candies, and a full hopper for each game (you can buy additional paintballs for $5/100). Download a Paintball Tournament flier, Paintball Tournament registration form and Paintball permission form and get your team ready to play some serious paintball!! YOU CANNOT PLAY WITHOUT HAVING A PERMISSION SLIP SIGNED BY A PARENT OR GUARDIAN. QUESTIONS?? Call or text DJ Ter Haar at 785-269-7492 anytime!